Out of overwhelming interest in my Sight Word Acquisition Book and Accompanying MP3, I have decided to upload the Alphabet Book and Accompanying MP3 I created to help my students learn the English letters and sounds. I know in U.S. schools many Kindergarten teachers are teaching their children the letters and sounds right now. I hope this can be of help to you. I wish I had been able to get it up last month but time has not permitted me to do so. I have used this book and MP3 practice with children ages 5 all the way to adults. It can be used for younger children as well. If you are teaching older students the English alphabet, you can use this book and accompanying MP3’s with them as well. Parents of ESL students I have worked with have had trouble facilitating their children with homework assignments. They have informed me that they have not known how to read pronounce the the alphabet letters and sounds but really want to help their children learn. 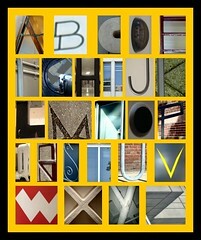 I am sharing this alphabet book and accompanying sound files so that you too can use it to help your students. Out of request and demand from the Sight Word Acquisition Book and MP3 files, I have made these files downloadable. You will be able to save these files to your computer. You will also be able to download them from your computer onto an i-pod, i-pad, i-phone, MP3 device, etc. or burn them to a CD. I created this book for use as homework facilitation by ELL students, however it can be used by any student. Co-workers have used this with students in their classrooms. They have printed the book and had students listen to the files on the computer or on the CD player. I have also used this in the classroom on a Smart Board. Students trace the words with the Smart Board pen as they listen to the MP3 files. In order to use the printed book or send it home as homework, you should have a sheet protector, dry erase pen and some sort of eraser for erasing the dry erase marks. I have bound the book or have put it in a ringed folder. The sheet protector is used by students to write on with the dry erase marker. The student places the sheet protector over the page he or she is working on. When prompted, the student traces or writes the the letter with the dry erase marker. Sheet protectors should be used because it’s less time-consuming than laminating each page, and still allows the books to be reused over and over again. Some students do not have access to MP3 devices or computers at home. In these instances I have burned the MP3 file to CD’s so that the student could play the recording on the CD player or DVD player they have at home. I hope you are able to use this as much as I have with facilitating student sight word and reading acquisition. Alphabet Acquisition Book by Beth Crumpler is licensed under a Creative Commons Attribution-NoDerivs 3.0 United States License. Based on a work at adaptivelearnin.files.wordpress.com. Alphabet Acquisition MP3 by Beth Crumpler is licensed under a Creative Commons Attribution-NoDerivs 3.0 United States License. Right-click the links and choose “Save Link As…” to save the MP3 file to your computer.